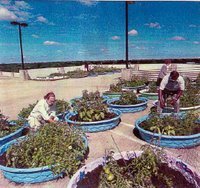 If you have an old kiddie wading pool or car tire laying around, consider using it to start a garden. This article, Urban Agriculture: A Guide to Container Gardens, tells you how to do it. I heard that the city of Santa Monica is considering devoting part of the top level of some parking garages into urban gardens. This Cycle Santa Monica blog post has more details.